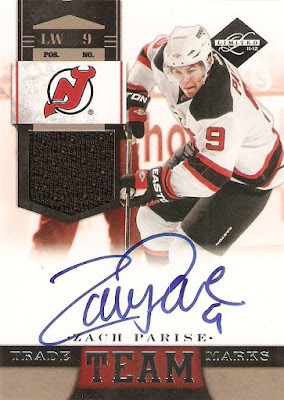 Back when I first got back into the hockey card game, the very first box of new product that I opened was 2011-12 Panini Limited. It was also the first mid-to-high-end product that I ever opened, and it introduced me to the idea of a low base/high hit product. I really like how the major elements of the card are highlighted. Base cards will give you full-color images that really take you into the game. These, on the other hand, sacrifice a little bit of the background in favor of the "hit." The player image is important, but room is always left for things like an autograph or a piece of memorabilia. I recently got my hands on two fantastic cards of Zach Parise from the 2011-12 Limited Team Trademarks insert set. 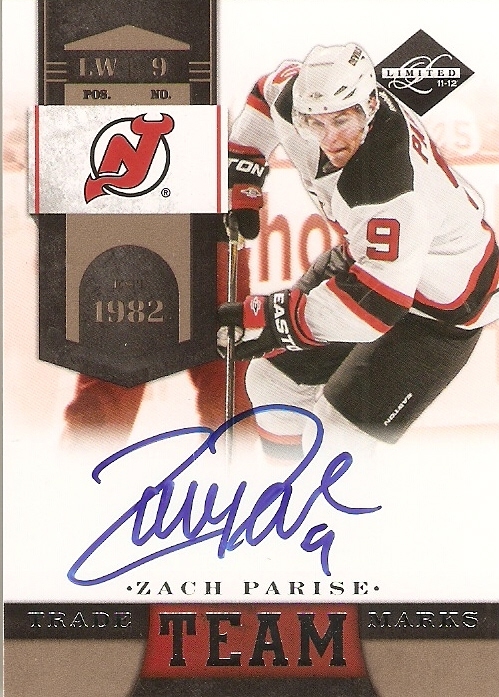 The first is an autographed jersey card, numbered 20/49, and the second of an autographed card, numbered 19/99. It's already April, and I finally got my hands on some cardboard. As I have now split my collecting interests between cards and autographed memorabilia, I haven't quite been buying as much cardboard as I used to. 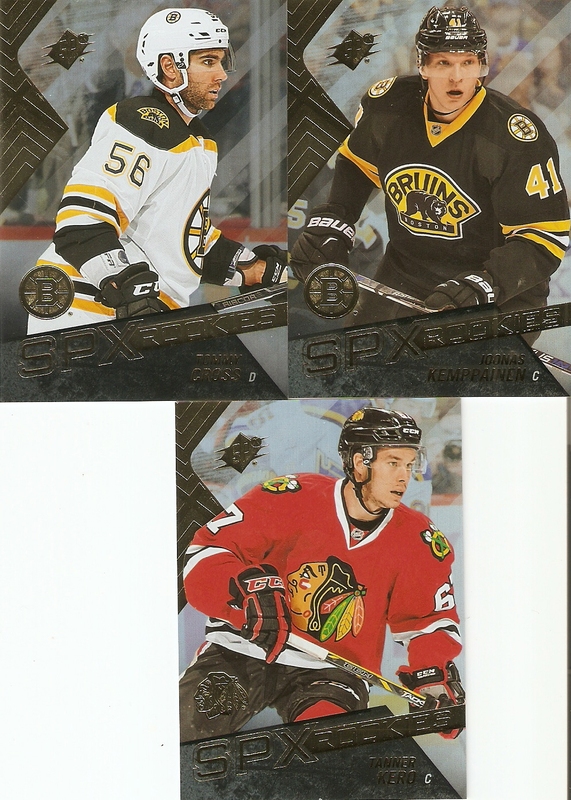 Still, I do like to open up a brand new box of cards, and picked up some 2015-16 SPX. 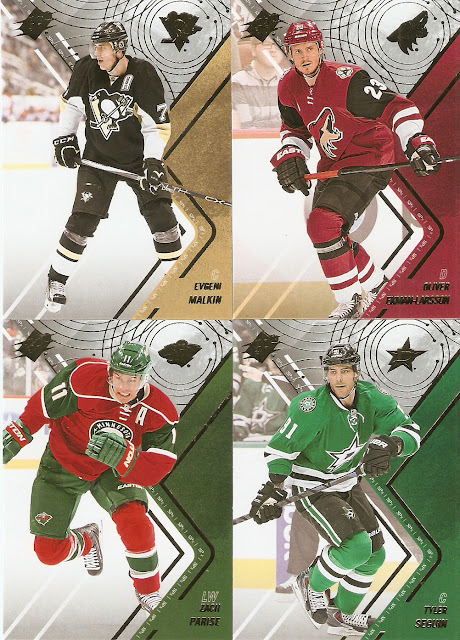 Base: Top four cards for my team/player interests were Evgeni Malkin, Oliver Ekman-Larsson, Zach Parise, & Tyler Seguin. 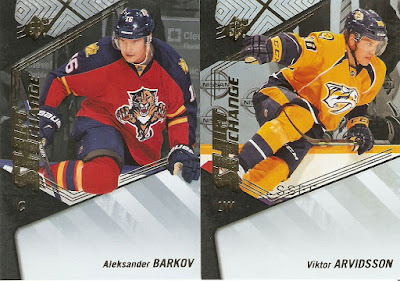 I like the design of the base cards. you have a slight design on the right side of the card that corresponds to the team color, with a little bit of gray on the top. 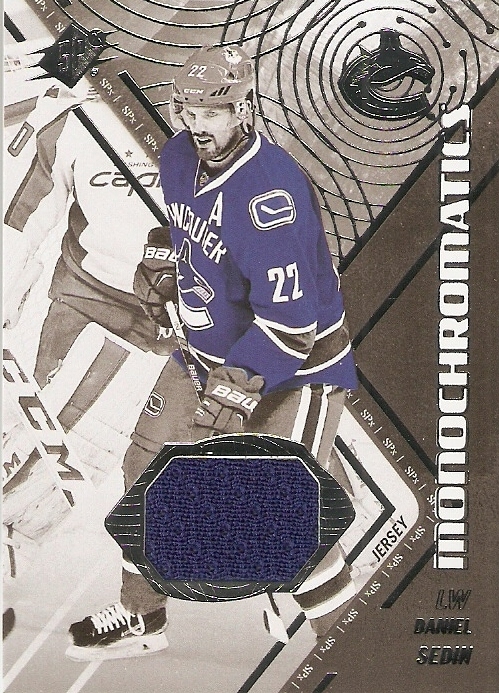 There isn't much of the actual background visible in the photos, but they way they have these laid out, it really makes the player image jump off of the cardboard. Two ok Bruins, but for me, Kero is the real winner here. It's not that I'm a Blackhawks fan, but Kero played in the USHL for my local team, the Fargo Force, and is the fourth Force alumnus to make it to the NHL. The title of the insert, I believe, makes reference to the Herb Brooks line in "Miracle," "The name on the front of your jersey is a hell of a lot important than the name on the back." 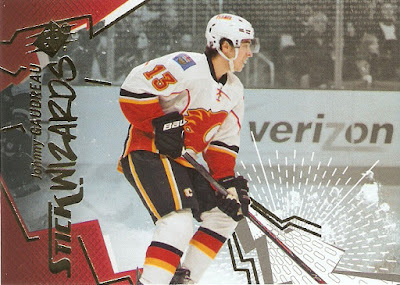 However, there isn't any reference made to the "name on the front," in the text on the back of the card, so maybe someone just thought it would be a cool name for an insert set. I guess this makes reference to a player who is a good stickhandler? 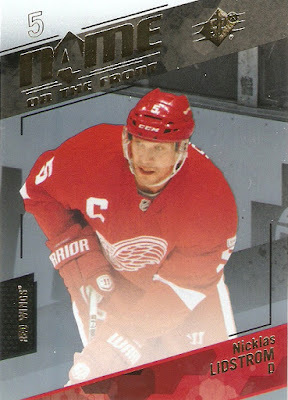 Like the Lidstrom card, the test on the back of the card makes no reference to anything about the name of the insert set. Still a nice-looking card, though. Again, I'm not sure what the name of the insert set has to do with anything, but I will say this: as a TTM collector, these would look amazing to be signed, especially right on that chunk of blank space on the bottom right of the card. OK, so these are really cool. Basically, It's a black and white image of the player, with one color. That color, of course, is for his jersey, and not only that, but the jersey swatch is of that same color. While some of their ideas with the insert sets seem kind of random, this is one that actually works, and looks fantastic. 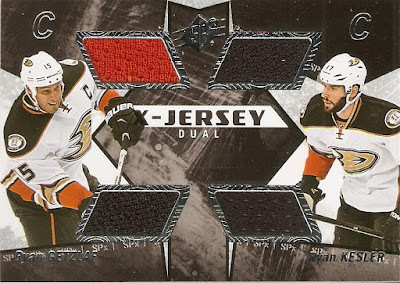 There really isn't much to this, other than it's a two-player, four-jersey-swatch card, and with the two Ryans, we have a couple of pretty decent players. Lastly, is the big draw, the guaranteed Autographed jersey rookie card. This one is of Winnipeg Jets goaltender Connor Hellebuyck, and features an autograph and two pieces of his jersey. I actually pulled a decent one, as Hellebuyck seems to be one of the brightest young stars in the Jets' system, and there will be an opportunity in the future for him to take things over. I kind of like this set. The hits are decent, and the base set looks really cool. I'm not sure if I will be investing any more money into this in the future, but it was still a fun break.